Wouldn't it be great if you didn't have to remember 25 different passwords? It can be very frustrating to sit down and try to access your bank website, or your eBay account, or some other site you have registered for and try to remember which username and password you used for that account. Internet Explorer offers a feature which can help solve this issue. Unfortunately, it is also a security risk. 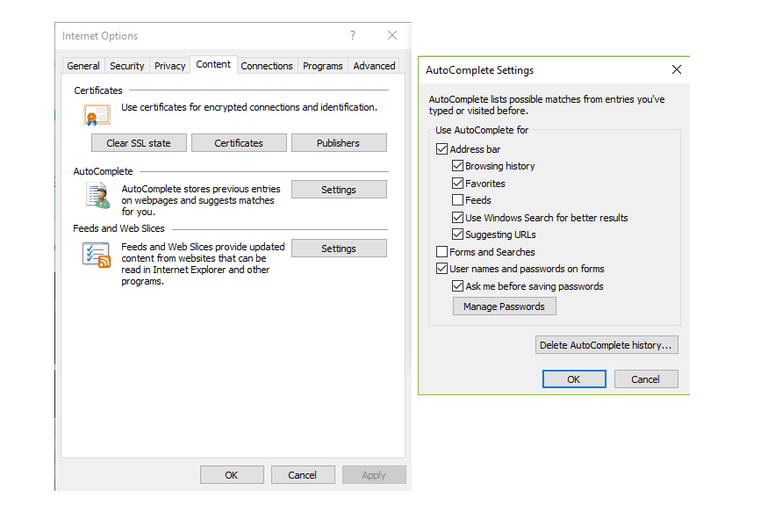 The AutoComplete feature in Internet Explorer can save web addresses, form data, and access credentials such as usernames and passwords. This information will then be automatically entered every time you visit the site again. The issue is that the credentials will also be automatically entered for anyone else who sits down at your computer and accesses those same sites. It defeats the purpose of having usernames and passwords if they are already automatically entered by your computer. In an Internet Explorer browser window, select Tools. On the Internet Options configuration console, select the Content tab. In the AutoComplete section, select the Settings button. You can select or de-select different types of information to store in AutoComplete. If an Administrator account is used to reset the Windows password for a user account, all stored information such as passwords will be erased. This is to prevent an Administrator from being able to gain access to your information by changing your password. The AutoComplete feature seems like a nice idea. It is helpful to use the AutoComplete of web addresses so that you only have to type in long URLs once and then Internet Explorer will remember them the next time. But, storing passwords in AutoComplete is a bad idea unless you have some other way of ensuring that nobody but you will ever have access to your computer. If remembering usernames and passwords is a problem, it's best to disable the AutoComplete feature and using one of the suggestions from Storing and Remembering Passwords Securely.